A 26-hour run from Bari, Italy to Corfu, Greece was fairly uneventful and with the wind behind us (well what wind there was). Being a foolish captain I tempted fate by commenting to Jennifer, “hey we have nothing to fix after this passage!” – Should have kept my mouth shut. When we went to drop the anchor the windlass wouldn’t work. Manually dropped the hook. Guess what just moved to the top of my To Do list? At least clearing into Greece went smoothly and we picked up our “transit log” (required of all cruisers in Greece.) We stayed in Corfu for a couple of days while I fixed our windlass and explored Old Corfu Town. 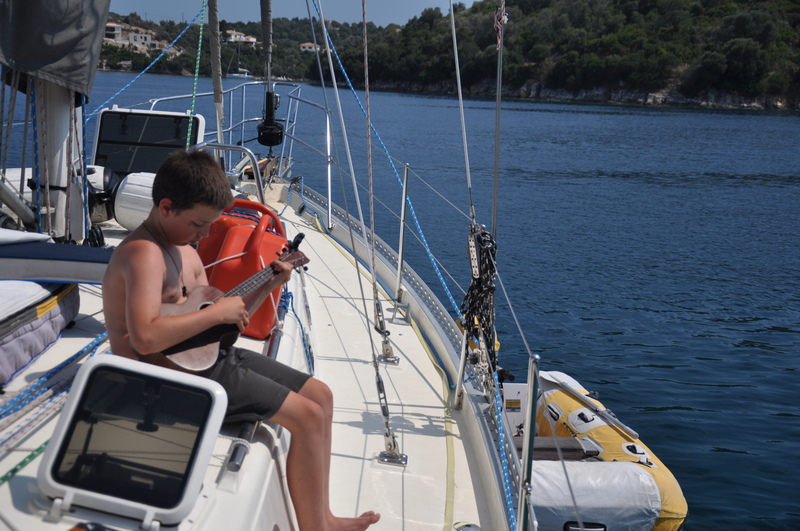 We sailed down to the island of Paxos, but the main anchorage was overly crowded and the overflow anchorage had poor holding and was littered with coral heads and rock. 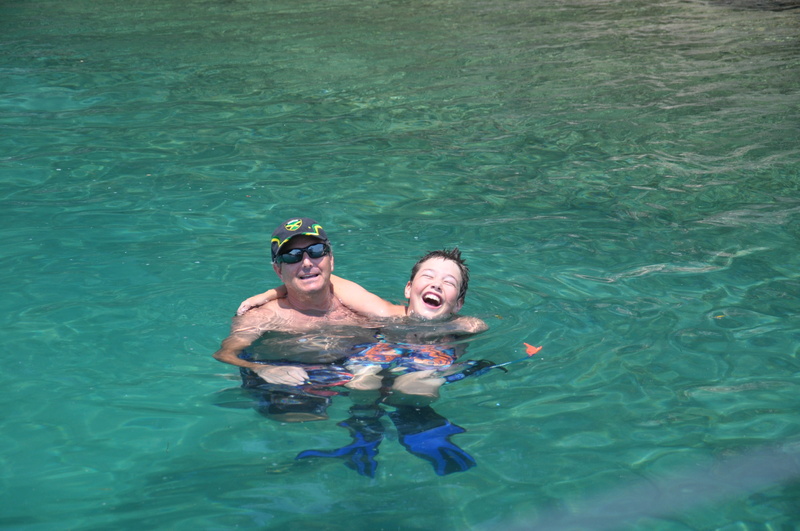 So we continued on to its smaller sister island, Antipaxos, and dug in at a nice anchorage with a sandy bottom and beautiful clear blue water. During the day, tons of ferry boats come in with partying day trippers, but in the evening it quieted down and we could enjoy the beautiful scenery in a quieter atmosphere. 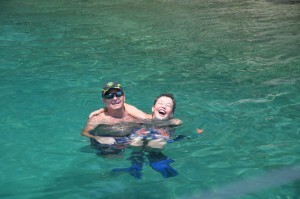 Dante was ecstatic to jump into clear, blue warm water again – reminiscent of the Caribbean and the Bahamas. Jenifer and I climbed to the top of the island to have a Mythos beer with a view of the anchorage, the island of Paxos and the island of Corfu beyond that. It was absolutely gorgeous. We chatted with our waiter about the looming debt crisis that Greece was voting on that weekend. Our waiter was going to vote NO on accepting the EU’s proposal. It’s finally truly warm weather now; reminiscent of our days sailing in the Pacific and Caribbean. We get up in the morning and put on our bathing suits. Not too shabby. 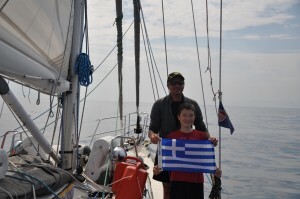 It’s a stark contrast to sailing in the Northern Mediterranean during the winter. The downside is that winds are light in this region of the Med at this time of year. A cruising boat from New Zealand that we chatted with called it the “Motorterranean” and they should know as they have been cruising here for the past 15 years. Needless to say this moniker seems to fit as we have had very little wind with which to sail on our short passages between Greek islands. After Antipaxos, we sailed through the Lefkas channel. It’s a small channel dredged between the island of Lefkas and mainland Greece. There is a bridge that has to be swung open in order to go down the channel and it is opened at the top of every hour. The bridge is around a tight corner in a small channel, and of course there are always boats waiting to go through. So you are slowly motoring about trying to maintain your position without playing bumper boats. After passing through the opened bridge, we motored down the dredged channel, past the town of Lefkas and to the anchorage at Ligia. It was blowing 20 knots (of course now we have wind when we don’t need it … ah sailing in the Med) as we went down the channel and arrived at the anchorage, but the wind calmed down at night so that it seemed like we were sleeping “on the hard”. 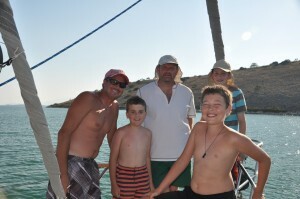 We then continued to Ormos Vlikho, a fantastic large and very protected anchorage near the town of Nidri. There we met an English couple aboard Earl Grey, and spent time having “sundowners” on Benevento and then all met up for a great Greek dinner in town. 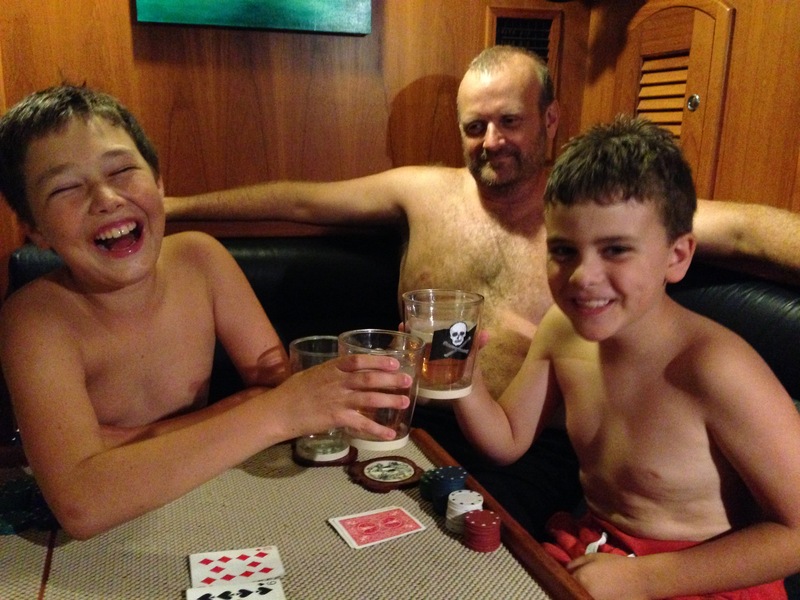 The anchorage was fantastic, but it had a lot of boats in it (including water-skiers) and we were looking for something quieter and more secluded while we waited for the Blois crew to arrive (our friend Erik and his two boys, Lanse and Lukas). We motored over to the island of Nisos Meganisi and did a “Greek moor” at little bay of Ormos Kapali. The bay itself is deep up until you get close to shore so you can’t anchor with proper scope. So what people do here is drop the anchor in about 30-40 feet and back up towards the shore, then take a long line and tie it to a tree on shore (by swimming or by dinghy to it). Our first attempt at this type of mooring must have looked funny. But we went slowly and at the end we were stern-to the island with Benevento in the middle of two stern lines tied to trees on shore, with cones on the lines to prevent any critters (stowaways) from coming aboard. This anchorage is definitely a “settled weather” anchoring situation. The next day a charter boat with a Belgian couple (Axel and Valerie) came to moor next to us. They didn’t seem to like the way their anchor was set so they re-tried setting it a couple of times. They were taking it slow and doing it right, but I got in the dinghy and offered to help, which they accepted greatly. 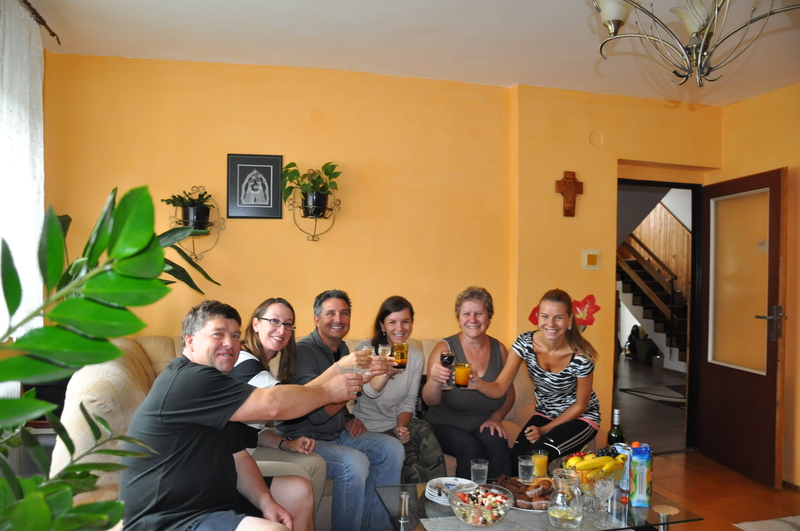 They got settled in, and later that day we had drinks on Benevento and dinner on their boat (until 3 am). One fun fact we learned from Axel and Valerie is about the tradition of touching glasses to each other while toasting began in the Middle Ages, when people used to drink in huge wood flagons. They would slam their flagons together before drinking, and in doing this, liquid from each drinking vessel would get in the other. This was a sign of trust because if you end up drinking the little bit of your drinking partner’s liquid that got into your drink, you would trust that he is not poisoning you. 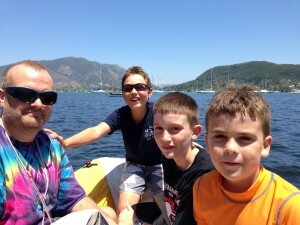 We made it back to the anchorage off of Levkas Island, where we would meet up with the Blois family. 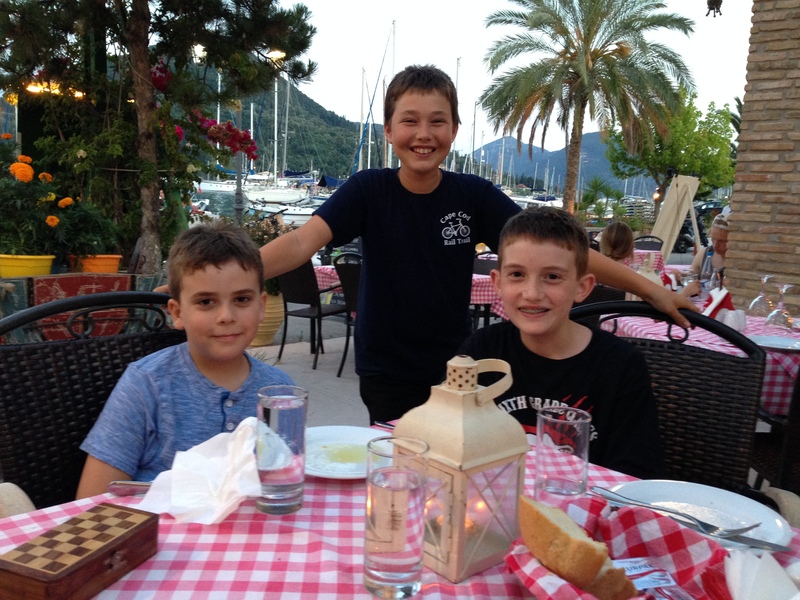 We successfully picked them up and spent the next eight days with them on the island of Levkas and at a secluded anchorage about 25 miles south. It was a new moon while we were at the this anchorage and the stars at night were incredible. We clearly saw the Milky Way and witnessed traversing satellites, planets and numerous falling stars. There was nothing for us to do but swim, play Hearts, and try to stay cool in the 95 degree heat. Our original intention was to sail past the Oracle at Delphi (which we would visit), through the Corinth Canal and then settle in at an anchorage near Athens. Unfortunately, Benevento had a different plan. We were getting ready to leave for our next anchorage and performing our “shove off procedure.” I was checking that the engine thru-hull was open and as I did so, I noticed that the compartment was filled with a red automatic transmission fluid. Jen could hear the alarm in my voice when I said, “That’s not good.” Erik took the boys to shore while Jen and I tried to sort out the problem. According to Jen she literally felt a cold sweat coming over her when I at first proclaimed that it was the rear seal for the gear box that had failed. With that realization, we knew our trip in Greece had come to an end. We would have to stay at the anchorage for a few days and then make our way back to Levkas under sail alone, where we could order parts or have the gearbox worked on if it was damaged. We were up against the clock as we needed to make progress to Spain where Jen and Dante would fly home from, and I would have to get to Gibraltar by mid October. So all our travel time in Greece was now being diverted to this quickly needed repair. We were so disappointed for the Blois family (and for us) and we absorbed the reality of what a busted gearbox seal would mean for us (not the least of which would possibly be to have to pull the boat out of the water at a shipyard.) 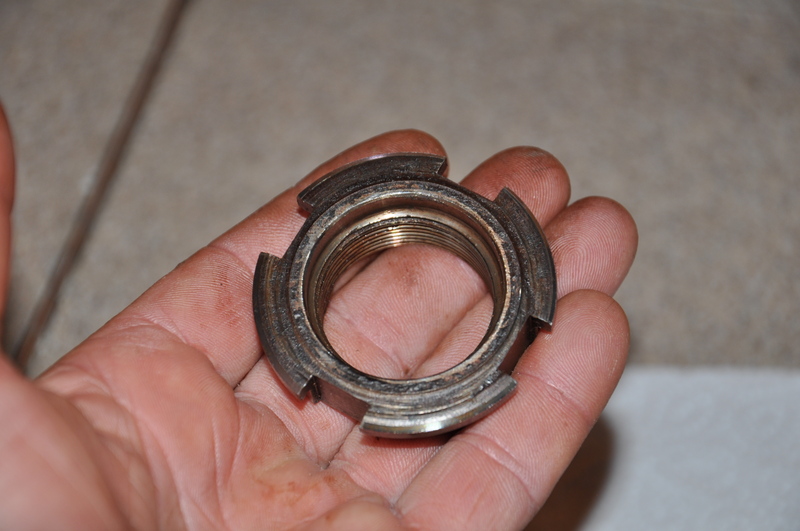 However, over the next couple of days we did more investigation and realized that it was the gearbox flange that had slid out of the gearbox because the nut had become loose. (The gearbox flange, for our less technical friend, is basically what connects the prop shaft to the gearbox). 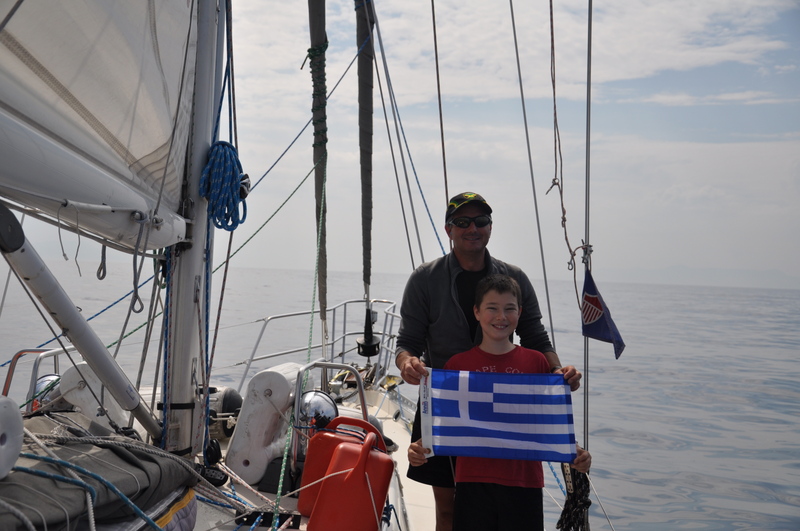 This may not be as bad as we initially thought, but we still need to sail 30 miles back to Lefkas. This sounds easier than done. 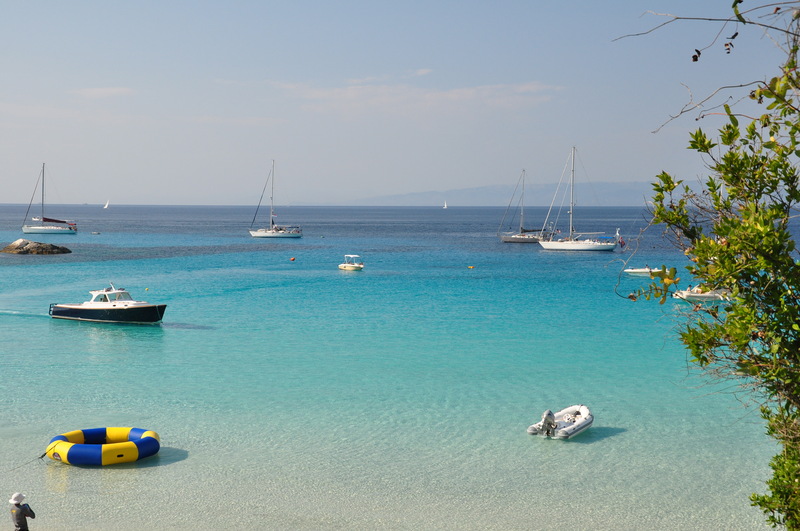 Remember, the Ionian Sea at this time of year if pretty windless. “Give me 30 knots of winds over 3 knot any day of the week,” I tell Jennifer. I can trim the sails in heavy winds, but I can’t prevent my boat from drifting onto the rocks in no wind (well I can but it becomes a lot more work involving our dingy, etc but we’ll get to that momentarily). 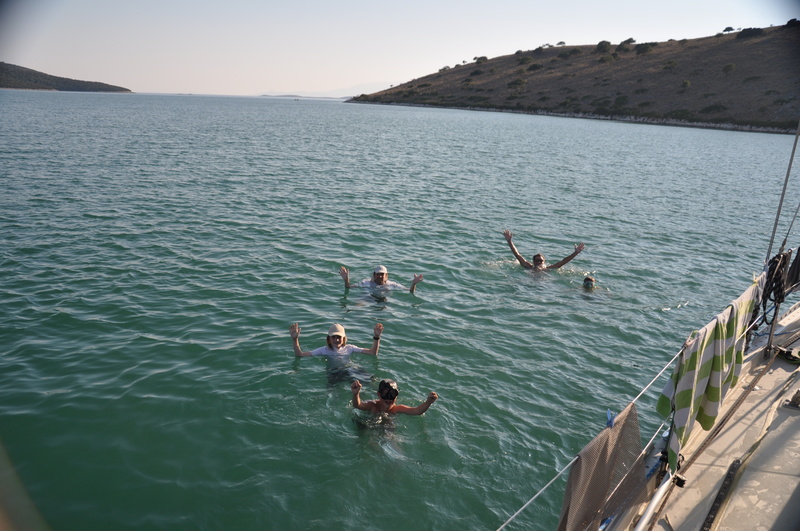 So with this in mind, we started to make our way early in the morning (to allow us enough time) to travel the 30 nautical miles to Nidri on Levkas Island. We pulled up the anchor (which took 30 minutes with no engine and light winds – we had to sail off the anchor) and safely rounded the point of the island. We spent the next 13 hours trying to “sail.” It was mildly stressful as we had to avoid drifting onto some islands. As we approached our destination the wind decided to whip up to 25 knots. I’m thinking “great plenty of wind to sail us down the channel to our new anchorage”. However, as we approached the channel, and came into the lee of a point, the wind died down to less than 5 kts. Not enough wind to negotiate the narrow channel filled with charter boats, parasailers, wind surfers, dinghies, fishing boats, ferries and RIBs. Plan B- heave-to and drop our dinghy in the water (which was on our stern davits), and then swing our 100-pound engine on to the dingy. With that done, Erik became our tug boat captain. With the the dinghy tied to our starboard quarter going at about 1/4 throttle we piloted Benevento to her new home. We even were able to use the dingy to back down to set our anchor. Probably not set as well as would would like. but with a 10:1 scope (all chain) it would take a strong hurricane to move us. Safely anchored after a day in which we averaged less than 2 knots an hour, we gratefully sucked down a few cold beers, happy to have that long day behind us. We spent several weeks ordering and waiting for the parts so that we could make the repairs. We hung out at the Vliho Yacht Club with its cool fans, laundry machines at 4 Euro per load (a bargain in Europe), and free wifi. We also did our best to stay cool in temperatures of the mid to high 90s. It is so hot that all the mosquitos have quit torturing Jen at night. Jen here …. “It is so hot that by 8:30 in the morning we are in our bathing suits literally streaming with sweat if we do more than breathe. It is so hot that we can’t use the stove on the boat or it turns it into an unbearable inferno. It is so hot that the Greek people we meet say to us, ‘It’s really hot, isn’t it? !’ However – I am NOT complaining. I prefer constantly sweating to constantly shivering and I promised – as we were freezing cold while cruising over the winter – that I would not complain when it got hot. So I am not complaining; I am merely stating the facts!” Back to my honey…. 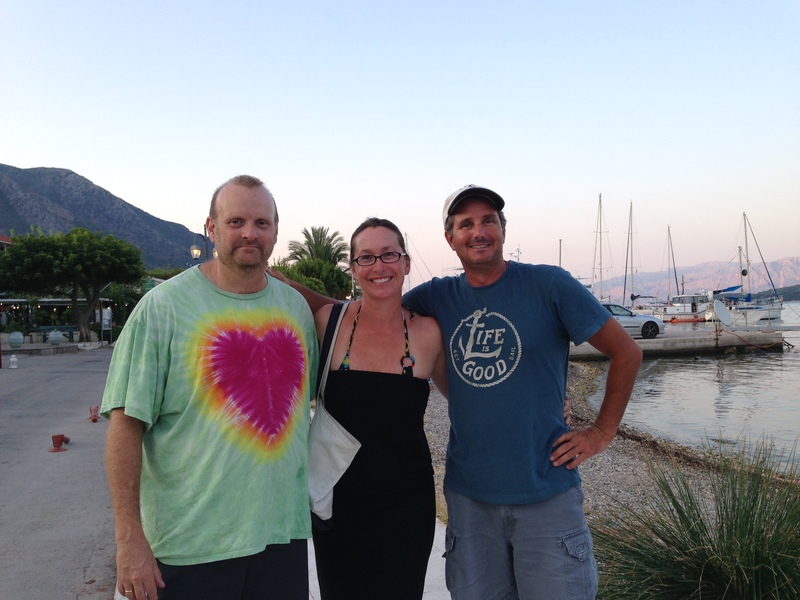 Unfortunately, our boat repairs robbed us of the time we needed to visit other parts of Greece. We missed the Corinth Canal (something we’d been looking forward to since we left San Francisco), the Oracle at Delphi and Athens. The good news is there was no permanent damage done and everything is running A OK now. And to boot we met a fabulous Brazilian couple and spent a couple of evenings on their boat sharing stories and having drinks. For more pictures go to our Flickr site!